06:06 There is no such thing as a bad macronutrient. There are just bad diets and bad lifestyles and there are bad stressors and there are bad hormonal responses to food based on the individual. There are so many variables involved that just blaming a macronutrient is not only not very scientific, but it’s flat out stupid. So we shouldn’t do that, so carbohydrates were really professed and push forward back in those timeframes. 06:43 An essential nutrient is a nutrient you need for survival. Okay? You need protein to survive. You need fat to survive. You can live without carbohydrates. 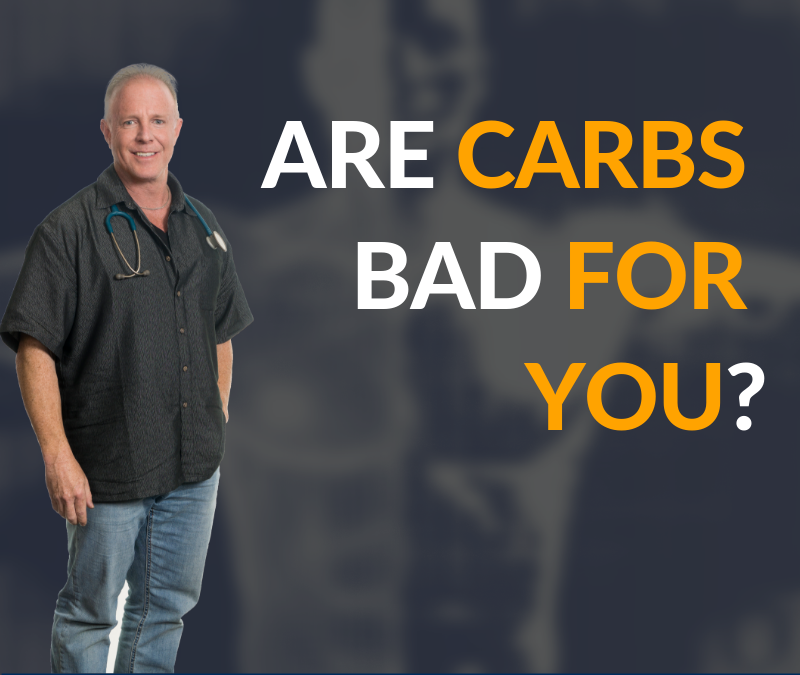 Carbohydrates are not an essential nutrient and that doesn’t make them bad. Your body doesn’t need them. It can make sugar out of protein sources. It’s a process called Gluconeogenesis, Gluco for sugar, Glucose, Neo, new genesis or production of from a non original source. So Gluconeogenesis takes protein, turns into sugar, feeds the brain, feeds the kidneys, feeds red blood cells. Those are the three arrogance. Absolutely have to have sugar and you’re okay. You don’t need carbohydrates. 07:44 they lived on whale and seal, blubber and meat and were fine. Healthy, no heart disease and cancers. Lean mean fighting machines until Mcdonald’s came in. We won’t go down that road. But fat and protein are essential. Carbs are not essential. 10:30 Well, early studies show that as little as 15 grams of carbohydrates a day can limit nitrogen loss, and that’s utilization of your biceps for energy for your brain. So just a little bit of carbohydrates keeps sugar high enough to where the body’s not going to tear down your muscle to make sugar. Now everyone’s a little different. They’re rising carbon hydrated and take to around 50 to 100 grams really limits the body’s use of amino acids for Gluconeogenesis or like I like to tell people, bicep food for your brain. That limits it by going a little higher. And that occurs via two mechanisms. One, the increased carbon take maintains blood sugar and insulin at a slightly higher level there by suppressing cortisol. 11:19 Cortisol, your breakdown or what we call a catabolic hormone when you’re hungry, is high or you’re stressed or it’s high or you’re exercising too hard is high and insulin combat set, so having a good pre workout meal, keep in sugars, at least somewhat present throughout the day will inhibit cortisol. 11:59 basically the entire job of your neck down is to keep the neck up alive and so the brain, if it starts to get hungry, if it needs nutrients, it will start breaking the neck down, down. It’s going to survive. 15:58 the semi essential need of carbohydrates and that particularly comes up with exercise. You remember I talked about the way we ideally right a person’s eating plan is start with what’s your protein requirements based on you, your disease state, what you do in life, all those things, your age, your lean mass, all those things. Then what your activity level and based on that I’m going to help you determine the amount of carbs and the remainder is going to be fat. 17:44 our crossfitters, which I would put in that term. Our runners, are marathoners, our triathletes are swimmers, our bicyclists. Those are people where carbohydrates are needed. That’s what we call the semi essential carbohydrate needs. 19:10 Are carbohydrates needed for energy? Absolutely. As I just described and said a couple times based on your activity level, whether you’re a desk jockey or your construction worker, your carbohydrate requirements are different and understanding that and understanding your response to carbohydrates. What is your insulin sensitivity? Are your other hormones balanced? Is your thyroid working in manage your testosterone level adequate and women, are you still menstruating and have normal hormonal cycles? 19:58 Are carbohydrates the cause of fatness? Absolutely not. That is a myth. Oppressed by the Ketogenic preachers out there in certain people, people do wonderful and Ketogenic diets. I just wish that all of these before and after pictures extended for years, not months. 21:09 are carbohydrates the best tasting food out there? I would have to unanimously say most likely yes, especially when it’s mixed with fat and deep fried like donuts. Now, who doesn’t love donuts? That is part of the RecoverMe philosophy. You not here some proportion health professional such as myself telling you that donuts are awesome and tastes good. I’m telling you that because one, I’m not gonna lie to you. Everyone likes a donut. Number two, if you live the big picture, if you live the RecoverMe philosophy of health and well being and optimal living, having a donut here and there doesn’t hurt you. So, here it is…… Everyone likes a donut. Number two, if you live the big picture, if you live the RecoverMe philosophy of health and well being and optimal living, having a donut here and there doesn’t hurt you. That’s the point of RecoverMe is you have to live life. It’s a bigger picture. Carbs are not bad. They just might not be the best thing for you at your current stage in life. That’s why it’s sitting with a professional that understands that sitting with someone, getting some help and understanding the big picture so you can enjoy every day. It has longevity to enjoy your grandchildren and their children. That’s what we’re after. I think that’s what we’re all after and that’s looking at a big picture. So the first thing to do is don’t criminalize any macronutrients. American Dietetic Association, shame on you for criminalizing fat. Ketogenic people, shame on you for criminalizing carbohydrates. It’s an individual thing and it should be individual and that’s the whole RecoverMe philosophy. Enough preaching. Go have a donut. Maybe I shouldn’t record that. I should take that up, but anyway, you get my idea. Until next time, remember, RecoverMe meets you where you are. We can’t change your stressors. We can just help your body, mind, spirit, and soul deal with them. Then. Until next time, take care. A TIP FROM TODAY’S SHOW: Carbohydrates are not bad. They may not be essential in your particularly livelihood, but they’re certainly not bad. It’s a balance and understanding where are you right now and how can we optimize that.